Carbon - four (four single, two double or a triple and a single). Nitrogen - three (three single, one triple or a double and a single). Oxygen - two (two single or one double). As you drag an atom towards another, a bond shows automatically if both atoms have spare bonding capacity. The bond multiplicity is the maximum possible, so a lone nitrogen dragged to a lone carbon will generate a triple bond. We put any hydrogen atoms in place first to obtain the desired bond multiplicity. In order to obtain the correct bonding in limonene, shown in the first screenshot, we added some temporary hydrogen atoms. 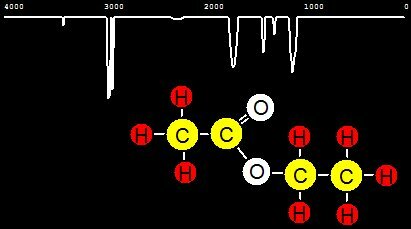 Can you use MolyMaker to draw limonene? 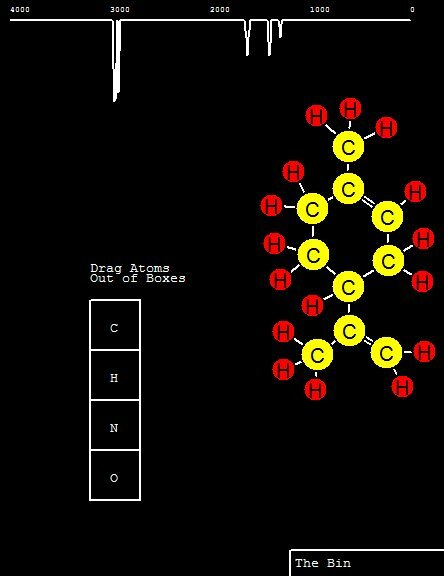 As you can see from the top of the screenshot, the program draws a predicted infrared spectrum for the molecule. This is hugely ambitious because of the potential complexity; professional attempts to predict spectra rely on published spectra for molecules that are closely related to the target. Lecture notes containing the actual spectrum of limonene (on page 7) give the important advice that the region from 1500-400cm-1 is the fingerprint region, which is individual to each molecule and does not have much useful information for product identification. A document entitled Interpreting IR spectra provides a useful, entertaining overview of the "interpretive power" of different regions of the spectrum. 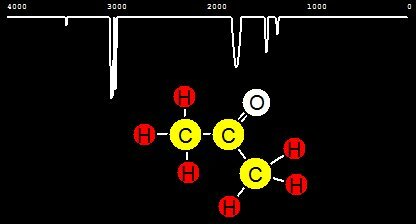 The following screenshots show the predicted spectra of ethanol, ethanoic acid, ethyl ethanoate, propanone and 1-aminobutane. The actual spectra appear in this guide. You can compare the region from 4000 to 1500 cm-1 in the predicted and observed spectra to judge the success of each prediction. Similarly, you can compare the predicted spectrum for acetonitrile with the published spectrum. In order to develop this program, you will need to have downloaded Stefan Berinde`s wingraph.zip file as described in our Graphics tutorial. You should copy the unzipped wincrt.pas, wingraph.pas and winmouse.pas (from the src folder) into your program folder. You can download a zip file (only 92KB) containing the source code, project information and MolyMaker.exe. //Spectrum contains peak height for every wavenumber integer from 1 to 4000cm-1. //Here it adds a peak around the entered wavenumber value in the spectrum array. //The peaks are made by a sine wave. Gd := 9;  //Set graphics driver to 9. Gm := 13; //Graphics mode will be set automatically. //Go through all the bonds for this atom. //If either atom is fully bonded don't allow another. //Go through all the bonds of the other atom. //User clicked on box to add new atom. //Go through all its linking atoms. //Go through all its links. //If it has found the link then shift all above it down over it. //Shift other atoms in its place to avoid empty spaces. //Now make every link to this atom one less because its id is one less.